This summer, we made some big changes. 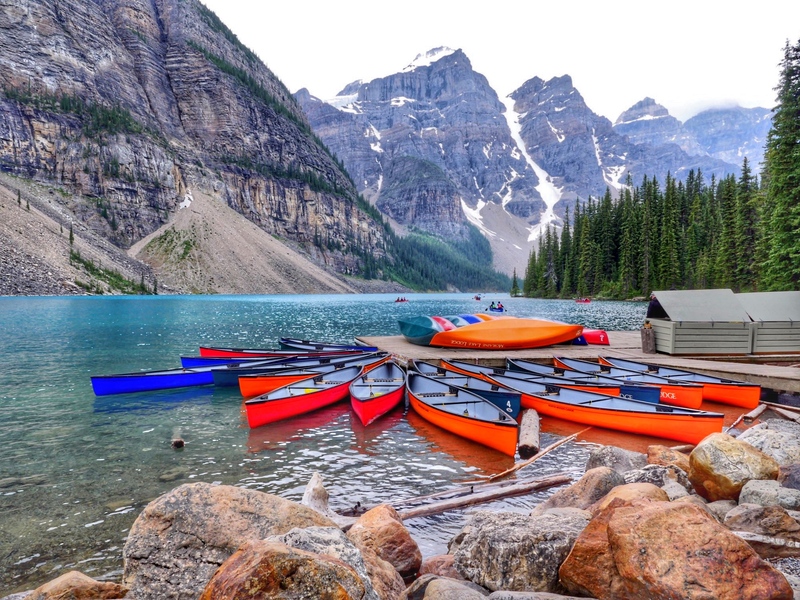 First and foremost, we picked up and moved west to Calgary, Alberta from Toronto, Ontario. As we prepped the kids for a new school year in a new city, we knew we needed to make another change. Charlie, seven years old, was sleeping on a stack of not one but 4 thin mattresses. Daily, she complained of having trouble falling asleep and woke up groggy and miserable. 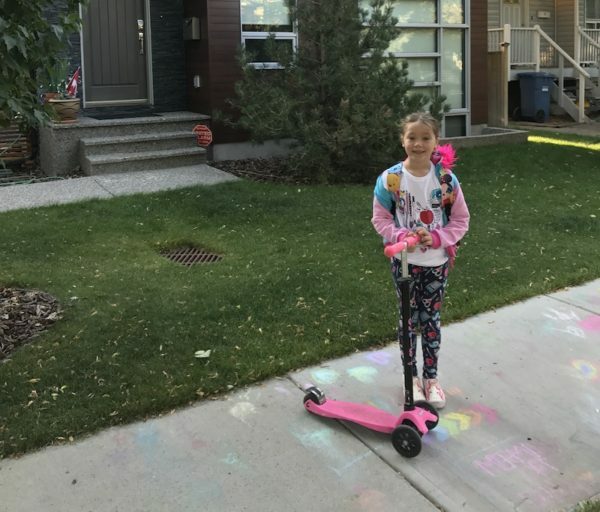 We knew the start of the school year, was the perfect time to start her on a new sleep track. 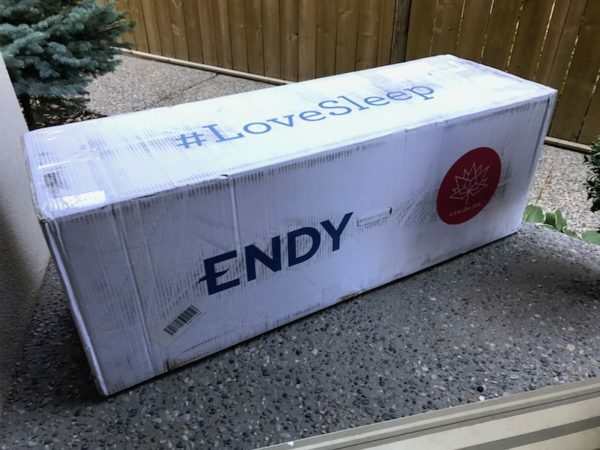 Deciding to partner with Endy to try out their Canadian made mattresses and pillows was easy. 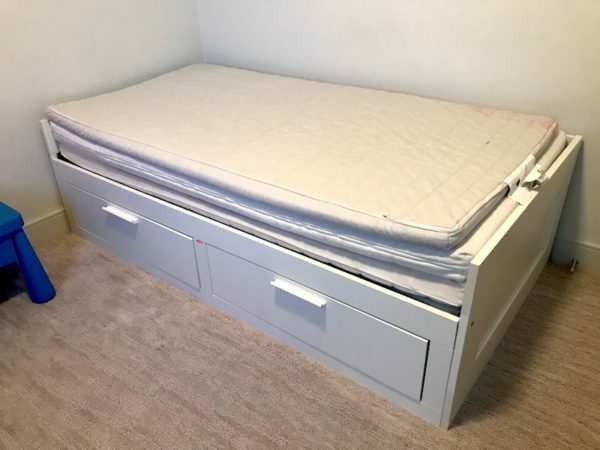 Endy offered a twin mattress that would fit into her existing bed frame and 100-night trial period. If we didn’t love it, they would come and pick it back up no questions asked for a full refund. What we didn’t expect was how much we would all love Charlie’s Endy mattress. I will admit to sneaking away during the day for a nap in her bed and often find Will, who is nine, asking for more sleepovers in Charlie’s room. Here’s what you need to know if you or your kids need a better night’s sleep. When researching Endy mattresses, I was quite sceptical of how good a mattress that came rolled up in a box could be. I remember the process of buying a king size mattress for my room which required moving trucks and over $5000. 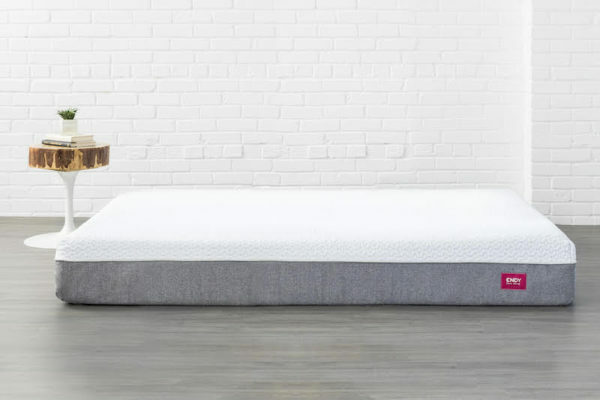 Even Will’s mattress, although newer, cost closer to $4000 instead of the $675 price tag on the Endy mattress. I was slightly perplexed when I opened the door to find the mailman easily carrying Charlie’s new mattress up my front steps. Endy mattresses come in a variety of sizes from Twin all the way to California King. You can check out all the sizes here. Endy provides a video that demonstrates how easy set up is. As an frequent furniture shopper, I can tell you that I was about as skeptical about these videos as I was the happy character in the IKEA assembly guide. Charlie and I got to work and in under 20 minutes we were officially done. The setup is really that easy. Open the box, unroll mattress, place on bed frame and you are done. I was really relieved to see that the mattress was true to size. The twin mattress fit easily into her twin frame. 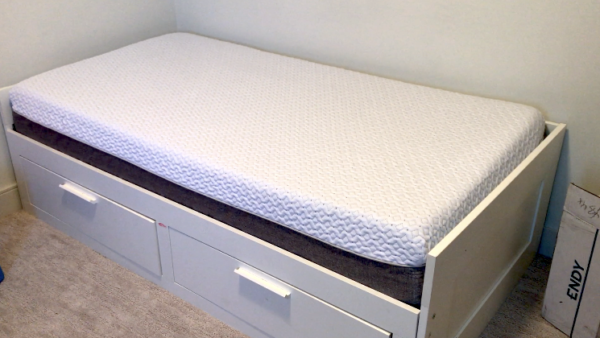 The height of the mattress is 10″ meaning you won’t require any extra layers or box springs. One thing that was really important to me was that Charlie’s mattress was hypoallergenic. As most of you know, we deal with allergies all the time at our house. I simply didn’t need an extra worry. I must admit that I am that mom that sometimes doesn’t exactly get to putting sheets back on the bed before the kids fall asleep. It’s definitely comforting to know that the mattress cover was sewn in Montreal, is completely removable, is made of hypoallergenic stretch-knit and is microquilted for comfort. When I first read about Endy mattresses, I took note of the 3 layers that make up the mattress. The top gel-infused layer is meant to help control body temperature throughout all four Canadian seasons. Seeing, there is already snow on the ground in Calgary, this is a definite plus. I noticed very quickly that Charlie stopped waking up really sweaty and stopped removing her blankets in the middle of the night. I am comforted by the fact that her body seems to be adjusting to temperature better which helps me sleep better too. The middle layer serves as a transfer point between the comfort-focused top layer and the high density support bottom layer. The bottom layer keeps Charlie properly supported in the correct posture for sleep. Something every growing body needs. The final thing we loved as a family was seeing the option for financing. Kids are expensive. The start of the school year means we are shelling out for everything from extra curricular activities to school uniforms. Having the option to make easy, manageable payments over a series of months makes it easier for families to make a change now and not have to wait until after Christmas. Not surprisingly, we haven’t found anything not to love so far. I will keep this post updated to see if the passage of time affects our feelings but so far we are super impressed with the mattress itself. Endy not only makes mattresses but makes what they call The Perfect Pillow. The pillow combines the support and breathable qualities of bamboo charcoal memory foam with the plush feeling of down. I can admit that the two pillows we tested are no longer in Charlie’s room. Instead, I noticed Will changed the Shopkins cover off of one and hide the pillow in a Star Wars pillowcase on his bed. I could only laugh, as I had done the same thing with the other pillow only a week before. The coolest feature of the pillow in my opinion is that you can actually remove some of the memory foam to adjust the pillow to your liking. Endy provides a mesh pouch to store the extra filling in case someone else wants to use the pillow and fill it back up. What I notice most about the pillow is that it actually stays quite cool so I don’t find myself needing to flip it over in the middle of the night to stay comfortable. 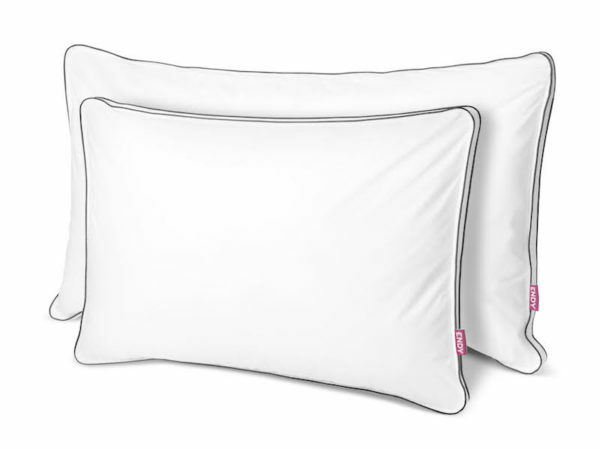 A standard pillow retails for $80 Canadian with free shipping across the Canadian provinces. Endy has asked me to share the love and pass on the opportunity for one reader to win two standard pillows from Endy. Enter below before November 4, 2017. Canada only, excludes QC. I truly believe in the importance of supporting Canadian companies. I was pleased to partner with Endy and even more pleased to see the quality of their products. The website provides quick customer service with a live chat feature and a real person on the other end who is waiting to answer any questions you may have. The impact getting a new Endy mattress has made on Charlie is evident. We are dealing with less late nights and much better mornings. The only issue is now it is us asking to sleep in her bed and I think she’s getting annoyed. DISCLAIMER: I partnered with Endy on this review. 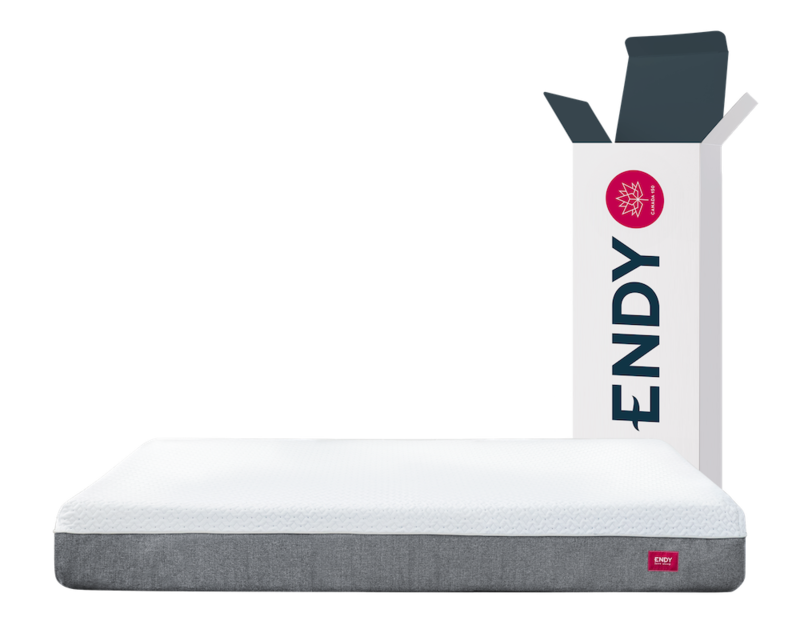 Endy provided us with the mattress and pillows so we could test them and give you our honest review. As always, opinions are completely my own (and Charlie’s). Great post! Came across this review while researching if Endy mattresses/pillows might be a good fit for my family and it seems promising! We’d love to be entered in the contest for the pillows!